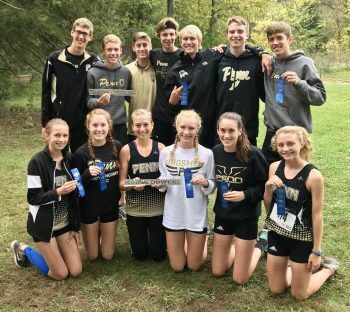 Both the Penn Cross Country boys and girls will be pursuing 2017 Indiana High School Athletic Association State Championships on Saturday, Oct. 28, in Terre Haute. The State Cross Country Championships will be run at the LaVern Gibson Championship Cross Country Course. The boys’ race will begin at 1 p.m., with the girls’ race following at 1:45 p.m.
After finishing fourth overall in the Semi-State Championship last weekend, the Kingsmen Boys runners will look to run their hearts out one last time. This will be the second consecutive State Finals appearance for the boys. Penn will be running Colton Shail, Curtis Cornell, Chad Piatt, Chandler Neal, Matt Long, Nick Sergeant, and Noah Cocquyt. “We know how hard we have worked all season, so we really just want to go out there and prove that all our hard work has paid off,” Curtis Cornell said. Last year, the Kingsmen placed 11th overall at the State Finals. This year, they hope to improve and break the Top 10. Penn’s Girls Cross Country team will also be making a return trip to the State Finals after a second-place finish at the Semi-State Championship last weekend. The Kingsmen girls will be running Lauren Frank, Dani Spring, Brooke Neal, Riley Keppler, Ellie Jankowski, Reagan Hoke, and Aislynn Alkire on Saturday. “It’s sad that our season is coming to an end, but this is an experience that I will take with me forever. Running at the State Finals with great competition should be really exciting for all of us,” Brooke Neal said. The Kingsmen finished in ninth place last year at the State Finals. As the season winds down, Penn looks to end their long journey with a statement at the biggest race of the year.